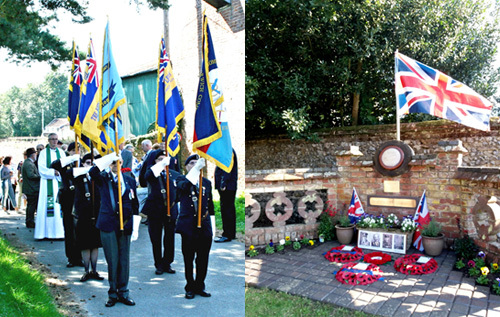 A ceremony was held on Sunday 2 September at the memorial on Booton Road, near Cawston, to commemorate the Handley Page Hampden bomber that crashed into Bluestone Plantation in February 1941. All the aircrew were killed: Flt Lt John Frutiger, Flt Sgt Robert Chanin, Flt Sgt John Hill and Flt Sgt Robert Gapp of No. 61 Squadron RAF. After a service in St Agnes’ Cawston, the memorial plaque was unveiled by Cawston Parish Council chairman Brian Schuil, which was followed by laying of wreaths. The church service and plaque dedication ceremony, led by Revd Andrew Whitehead, was attended by a large contingent of Cawston residents, along with representatives of the Royal British Legion and relatives of the airmen. A bugler played the Last Post and there was a flypast by two aircraft.